**Tuesday’s menu: Pasta. Roasted tomato sauce (prepared the day before). Pan-fried tofu. Steamed fresh spinach. **Original plan: Monday was Thanksgiving, and a holiday, and somehow meal-planning for the week ahead escaped me utterly. I jotted down a quick list of veggies on hand, and hoped it would provide inspiration throughout the week. Hey, the spinach got used. **In the kitchen: Whipped up after swim lessons. The item that took the longest was the pasta (waiting for the water to boil!) I’d just read an article in Macleans extolling the use of butter, so must confess butter was added to … everything. **The reviews: AppleApple did not get to eat until after her soccer. I did not get to eat until after dropping her off at soccer (I also went for a run.) When I came home, I traded off with Kevin, who left for a soccer meeting. In my absence, supper had been eaten. The spinach was untouched (forgotten?) Was it ever delicious. And buttery. **The verdict: Good leftovers. AppleApple ate pasta and sauce as a bedtime snack and declared it very good. **Wednesday’s menu: Beans and rice (pictured above). Cabbage/daikon slaw. Tomato-cilantro salad. 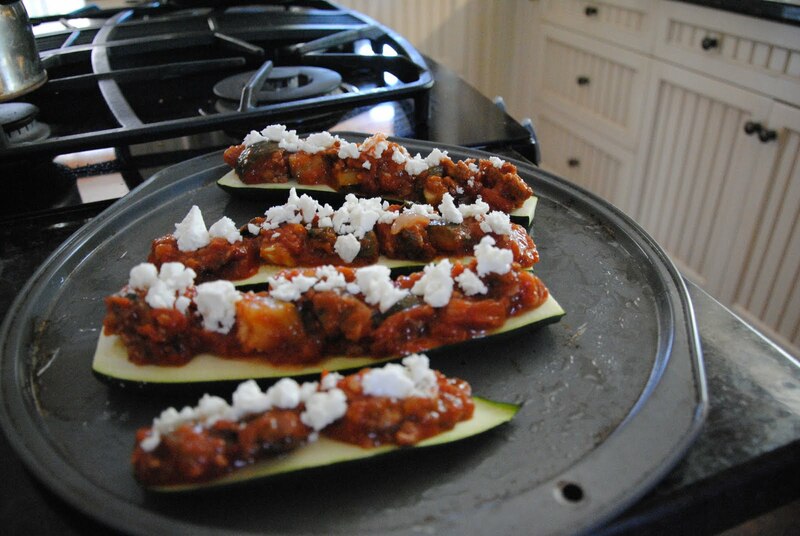 Broiled eggplant and zucchini. Condiments (crema, hot sauce, feta.) Tortilla chips and tortillas. **Original plan: There was no plan. So I’m pleased with this feast. **In the kitchen: Washed, quick-soaked, and started cooking beans first thing in the morning. Baked rice in the afternoon, left in the oven (oven turned off). Thawed tortillas. Post-piano lessons looked to the veggies in the fridge for inspiration. **The reviews: So good, I couldn’t bear to miss it to go to yoga class as planned. **The verdict: Excellent. We lingered, we talked. **Thursday’s menu: Squash soup with leeks. Beets, potatoes, and carrots roasted with garlic. Broccoli with cheese sauce. Bread and cheese. **Original plan: Thursday is the only day of the week that we don’t have an activity after school, or something one of us is rushing to immediately after supper. Yes, that’s sad. Or active. Or both. But it means that Thursday is my happy cooking afternoon. **In the kitchen: Whipped up after school. Roasted the veggies with fresh thyme picked from our driveway (doesn’t that sound appetizing?) After roasting, tossed them with a vinegrette. Broccoli with cheese sauce was by request. Have I mentioned how much I love requests? **The reviews: Some were not happy, except with the broccoli/cheese sauce combo (popular despite being made with a sharp swiss). Others thought it was the best meal of the week. And that’s saying something. It was a good week, food-wise. **The verdict: Speaking for myself, I couldn’t stop eating. **Friday’s menu: Gallo pinto (beans and rice fried together), with tortilla chips, crema, cabbage salad, and salsa. Plus a ham sandwich for soccer girl, and an energy bar for me. Yum? **Original plan: Leftovers. But the kids wanted a real meal. Gallo pinto technically is leftovers, but, rebranded, is much preferred over those other leftover leftovers. **In the kitchen: Kev did the frying. We were just home from skating. I was getting ready for a run, and soccer girl was getting ready for soccer (I’m getting in the habit of taking her to soccer, then running trails while she’s there). **The verdict: Not too shabby. Even eaten cold, after the kids are in bed, accompanied by a glass of wine. Ah, Friday. **Weekend kitchen accomplishments: Nothing. Nada. Nope. Home alone with kids on Saturday, so I cleaned and tidied instead of cooking or baking. Plus we went to the grocery store and stocked up on junk food. I’m whispering that. Then we hosted four extra kids overnight (our turn in a babysitting exchange!) and ordered in pizza. And today Kevin has a soccer game, and soccer girl has another practice during which I’m going to go running in the rain, and you know, there’s a fair bit of bread still frozen in the freezer, and we’re not yet out of yogurt, and we’ve got junk food. Whispered. Everyone needs a break from time to time. Last week in suppers: October is here! 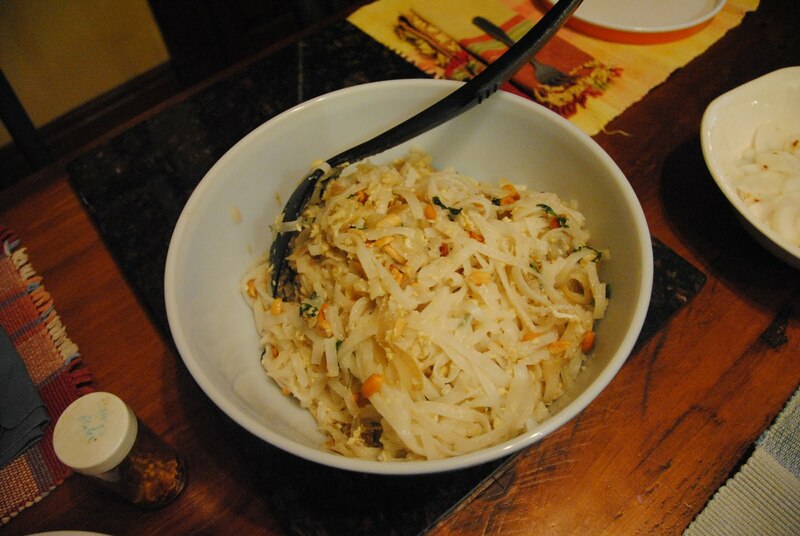 **Monday’s menu: Pad thai (pictured above). Broiled shrimp and tofu. Daikon salad. Stir-fried rainbow chard. **Original plan: Pad thai with hot and sour soup. But both things require tons of pre-prep organizing and stirring up multiple bowls of things, so I decided to simplify. **In the kitchen: Whipped up after school. The pad thai is a version without ketchup; it’s made with fish sauce and lemon juice and piles of cilantro (not vegetarian, no). **The reviews: Eaten too hurriedly for reviews, but everyone seemed happy. **Bonus recipe: Radish salad was made by slicing the daikon super-thin, then mixing up a dressing of fresh lime juice and maple syrup, plus salt. Sprinkle on some hot pepper flakes. Divine. (My invention). **Tuesday’s menu: Honey-baked lentils. Steamed rice. **Original plan: Yup. This one was by request. It needs a vegetable, I know. I’m not awake enough to think of one. **In the kitchen: Easy work, completed after waking from a killer morning nap, following my night of doula’ing in Toronto. Turn oven off, leave until suppertime. Eaten post-swim lessons. **The reviews: I didn’t get to hear the full reviews, due to racing off to a soccer coaching clinic with AppleApple. She ate a sandwich instead. But when we left, CJ was in the throes of an impressive tantrum because he couldn’t SEE the honey in the lentils. A reliable source tells me he became so incensed that he bit the table, at which point everyone started laughing, even him. But he didn’t eat the lentils. Everyone else did, however, and within 24 hours, it was gone. **The verdict: Good meal to make in advance. And yum. **Wednesday’s menu: Leek and potato soup (crockpot). Bread, hard-boiled eggs, cheese, sliced tomatoes. **The reviews: “It looks different, but it tastes the same. Like, no offense, Mom, but when I saw you with that big bowl of vegetables this morning …” -Albus (I did use lots of leeks; and the soup had a greenish yellow tinge that was slightly unappetizing, or, in Albus’s words, “kind of looks like barf.”) Unfortunately for us, right about then, CJ gagged on his egg yolk and threw up an entire egg right onto his plate. I would characterize the moment as matter-of-fact rather than dramatic. Thus endeth supper. You’re all racing to make leek and potato soup right now, I can tell. I was solo parenting because Kevin was in Toronto. **The verdict: Actually a really good meal, both food and chat. **Thursday’s menu: Curried lentil soup (crockpot). Saag paneer. Baked brown rice. Plus leftover white rice. **Original plan: For some reason, when I made the menus on Sunday evening, I was hankering for risotto and had written that down in place of regular rice. Who has time to stir the risotto? Not I, at least, not yesterday. So I threw a lentil soup in the crockpot and made brown rice instead. **In the kitchen: Was chopping onions for soup when the electrician knocked on the door to go over the outlets and light fixtures and other things requiring thought and decision-making; but that wasn’t all. The kids were finishing breakfast and getting packed for school. Kevin was in Toronto (yes, again). Another parent was telephoning to tell me about a last-minute change to school-walking plans. Albus was refusing to walk his little sister. “Where is the electrical box, can you show me?” “You’re so mean! I never get a chance to talk to my friends! And now you’re going to make me walk her!” Chop, chop, chop onions. The thought crossed my mind: I can’t hold this together. But then I did. On with the day. **The reviews: Most chose the brown rice and we talked about how nutritious it is. Does it taste different from white rice? We debated. Fooey gobbled the spinach and paneer and requested leftovers for her lunch box. Lentil soup was eaten. It was just me and the kids, and we enjoyed each other’s company. And they all ate lentils and brown rice and, at the very least, sampled spinach and paneer! An I-love-these-kids moment. **Friday’s menu: Bailey’s pickup supper. Plus picnic for soccer girl. Plus dinner out with girlfriends for me. **In the kitchen: Managed pickup and food storing in under an hour. Additionally, packed picnic, soccer bag, running gear, and ran out the door to pick up a car from the Grand River Carshare, which we just joined earlier in the week, in order to meet Kevin and kids at skating. **The verdict: All I can say is PHEW. We made it all happen. This scheduling stuff gets easier with time and experience. Weekend kitchen accomplishments: Four loaves of bread. Double-batch of waffles (three bags frozen for later). Pan of roasted tomatoes turned into sauce. Two jars of applesauce made from apples picked at Kevin’s family’s farm. Banana bran muffins. Note: All of this accomplished on Thanksgiving Monday. We spent the weekend with Kevin’s family. Good grief but it’s a hot day to have the oven on. I can’t believe I’m saying that about October 10th. Monday’s menu. Fresh tomato soup. Quesadillas. Green salad with maple dressing. The rationale. Corn tortillas languishing in freezer. Tomatoes rotting on counter. Quesadillas = Latin American grilled cheese sandwiches, ergo good for dipping in tomato soup. Green salad last minute raw veg addition. The reviews. Soup is bland (I blame you, Moosewood Cooks At Home). Fried quesadillas require last-minute labour and fill kitchen with smoke. Run out of corn tortillas; little kids prefer softer whole wheat version anyway. No dipping whatsoever. Quesadillas devoured. Sides of crema, yogurt, and asparagus salsa demanded. Green salad generally ignored. The verdict. Will not be repeating anytime soon. Tuesday’s menu. Red beans and baked white rice. Curried cauliflower. Roasted eggplant and patty-pan squash. The rationale. Original menu was quiche; not in mood to make quiche crusts. Brain searches for easy substitute. Need protein, ergo beans. Beans need rice. Cauliflower’s been on the menu for days, only to be dispatched with at last minute. Eggplant and patty-pans looking wilty. Planned to throw into curry, no room in pan, ergo tossed under broiler instead. The reviews. Beans good, rice good. Some eggplant burns while I blog about menu; the irony. The verdict. Anytime. This meal, give or take the veggie sides, is a forever keeper. Wednesday’s menu. Pasta with fresh-made pesto. Quinoa salad with spelt and leftover beans. The rationale. Bought basil for this purpose. Time to prep meal between nursery school and piano lessons. Meal needs to be served quickly upon arriving home from piano. The verdict. Both items are keepers. Pesto made with sunflower seeds = leftovers suitable for school lunches. Thursday’s menu. Fish* baked in a teriyaki/ginger marinade. Roasted potatoes. Sesame stir-fried spinach, zucchini, and eggplant. The rationale. Fish is quick. Daughter needs to eat supper in a hurry before early soccer practice. The verdict. Daughter eats potatoes and leftover quinoa salad, makes early soccer practice. I bat 3-6 on the fish, 0-4 on the children-eating-spinach, but I pitch a perfect potato game. Friday’s menu. Crockpot chili with stewing beef. Baguette. Cheese buns. The rationale. Crazy rushed schedule, ergo crockpot of leftover beans and tomato soup, plus seared beef** and fried onions and chili powder = supper. Pick-up from Bailey’s adds extras. The reviews. “Is this ketchup soup?”: CJ. “Is there meat in this soup?”: CJ. “Are there tomatoes in this soup?”: CJ. “I don’t like this soup.”: CJ. “It tastes rotten.”: CJ. The verdict. Everyone else has second helpings. Easy, fast, tasty with crema and crushed tortilla chips. Hey, it’s Friday. Instead, I woke up, started the laundry, hung a load from last night on the line outside, and turned on the radio, which is my constant companion on kitchen days. Then I began. I started by mixing and kneading a batch of bread and setting it to rise on the counter. I chopped and stewed plums and pears, which had been going to mush on the counter. 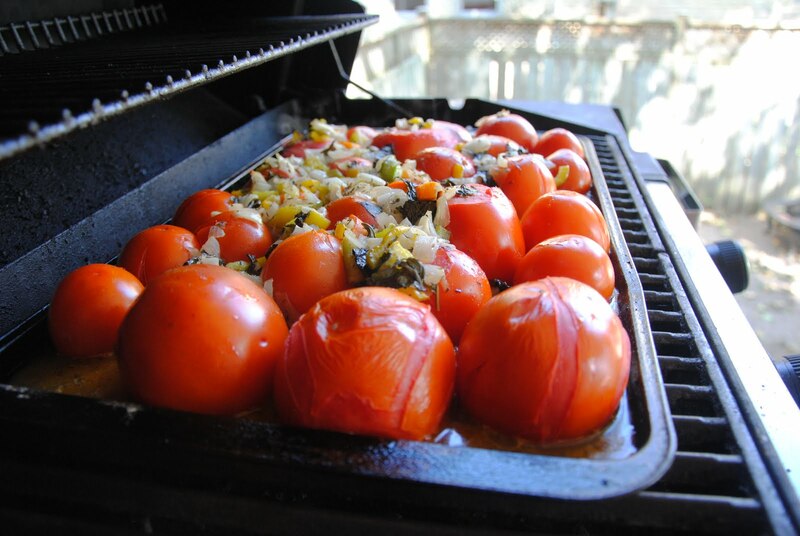 In another pot, I sauteed onions, garlic, and herbs, and on a baking sheet arranged whole, cored tomatoes. I fired up the BBQ to about 375, and roasted the tomatoes with the sauteed veggies for several hours. I heated milk and washed jars and made yogurt. I mixed up cookie dough and baked the worst cookies ever. (And I followed the recipe. I have no explanation, except that maybe the kitchen is politely telling me to scram). And I hung a second load of laundry on the line. Could that be all? I started before 9am, and it is now nearly 4pm. For my efforts, I have arrayed before me: 2 jars of plum-pearsauce; 4 loaves of bread; several litres of roasted tomato sauce; 6 jars of yogurt; and a batch of barely edible cookies. The week ahead, and its necessary meals, remains unplanned. I am, therefore, going to throw on my running gear and go for a looooooooong run in today’s remaining sunshine. Fooey and Kevin are in charge of supper: pita pizzas on the BBQ using that roasted tomato sauce (I scraped the roasted ingredients into a pot and macerated them using a hand blender). 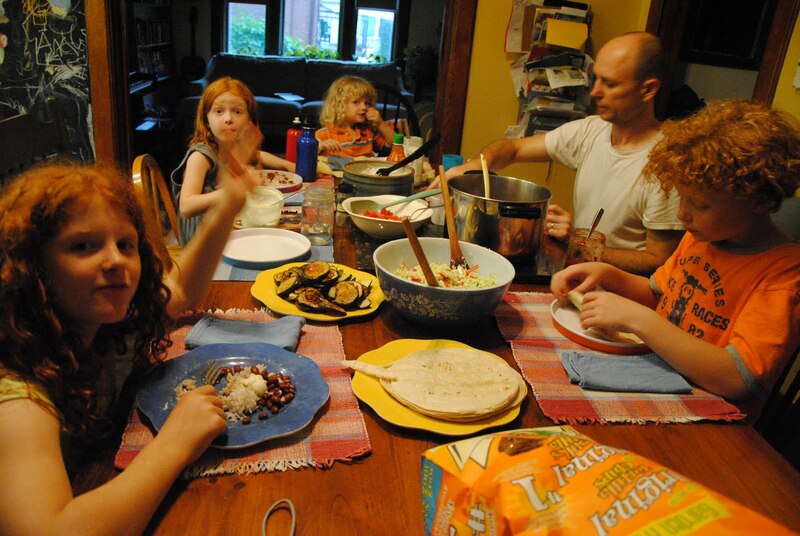 As the school year begins again, my mind returns to the necessity of producing weekday suppers, frequently to be eaten at a ridiculously early hour, or immediately upon arriving home, due to after-school and evening activities. 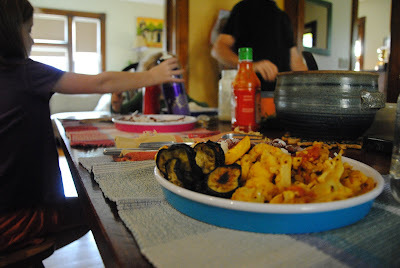 And so this blog will also return to a reprised version of The Week in Suppers. First edition coming tomorrow. Look for (mostly) vegetarian meal ideas, as our family attempts to go vegetarian for a month. Stay tuned. I bought a half-bushel of zucchini from Bailey’s Local Foods. I happen to love zucchini, though apparently I’m alone, in the family, in this regard, though everyone else will eat it disguised in muffins and zucchini bread without objection. (Odd side note: Kevin can’t tell cucumbers from zucchinis; he really can’t, on visual inspection. Neither can several of his children. This has made for some sandwich-related disappointment over the years). All of which is to say that the zucchini bruschetta, pictured above, was enjoyed only by me. But let me tell you, it’s such an excellent lunch. To make it yourself: Slice one or two zucchinis length-wise into two to four pieces, and brush lightly with olive oil (sprinkle of salt optional). On a tray, bake or broil the slices for a few minutes, until somewhat softened. Remove from oven and top with red sauce (in the photo above, that’s actually a leftover sauce made with chopped zucchini and eggplant, so basically I was eating zucchini garnished with zucchini). Sprinkle on some feta. Broil on high until bubbly. Eat. Feed to children at your own risk. The black-raspberry canes in our back yard are enjoying a fruitful season. Which makes for an excellent serve-yourself anytime snack. The very definition of local food. Get ’em while the gettin’s good. 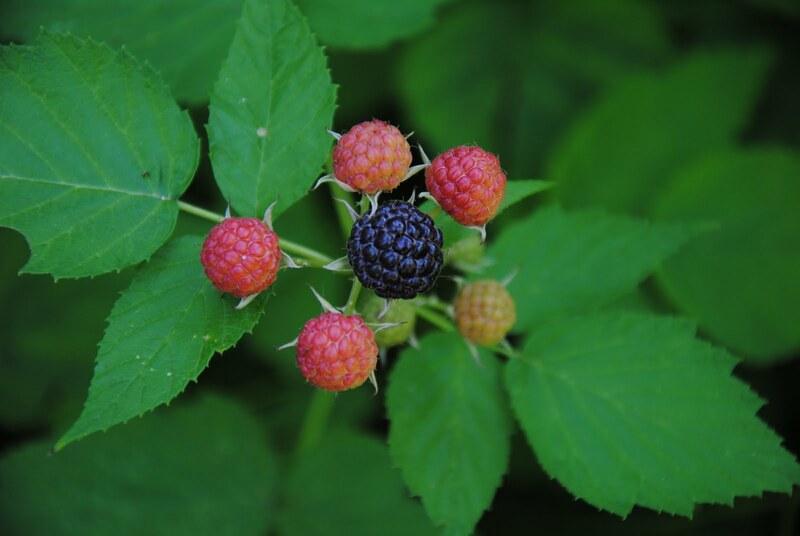 And if you’re of an entrepreneurial spirit, like AppleApple, you’ll spend a good half hour on a Saturday picking a pint of berries to sell to your mother (even better, you’ll employ your younger siblings at one penny per berry picked).